Smelts, breaded & pan fried. Whole Grilled, Cold Smoked Mackerel 100% All Natural. All soups are made fresh from scratch, daily. Traditional Greek soup, homemade chicken broth, rice and egg-lemon. Navy bean soup with fresh tomato, herbs & spices. Lentil & fresh tomato soup. Homemade Greek pasta & fresh tomato soup. Homemade beef broth with pieces of beef, vegetables & barley. Special Greek style chicken noodle soup with fresh tomato. Our famous fish soup made w/ fresh fish, in their own broth, w/ chopped vegetables. Family style 2 or more $4.95/person. Lettuce, tomato, cucumber, olives & feta cheese. Family style 2 or more $4.95/person. Vine tomatoes, cucumbers, onions, green peppers, olives & feta cheese. Cut chicken breast on top of our Greek salad. Add $1.50 on any other salad. Our homemade gyros meat on top of our Greek salad with a side of taztiki. Add $1.50 on any other salad. Family style 2 or more $4.95/person. Finely chopped romaine, green onions, dill & crumbled feta. Family style 2 or more $5.25/person. Chopped tomato, cucumber, onion, green pepper, beets, arugula, crumbled feta & olives. Choice of boiled Dandelion or Rapini greens. Choice of boiled Dandelion or Rapini greens, sauteed with fresh garlic & olive oil. Family style 2 or more $4.95/person. Chopped cabbage, carrots & celery. Family style 2 or more $4.95/person. Chopped lettuce, tomatoes, carrots, celery, green pepper, green onions & cheeses. Greek Sardines, sliced vine tomatoes, kefalograviera cheese, olives & fresh oregano with olive oil & vinegar. served with choice of soup & choice of rice, potatoes or mixed vegetables. Chicken baked in olive oil & spices. Baked Greek pasta, ground meat & cheese, topped with béchamel sauce. Baked eggplant, zucchini, potato & ground meat topped with béchamel sauce. 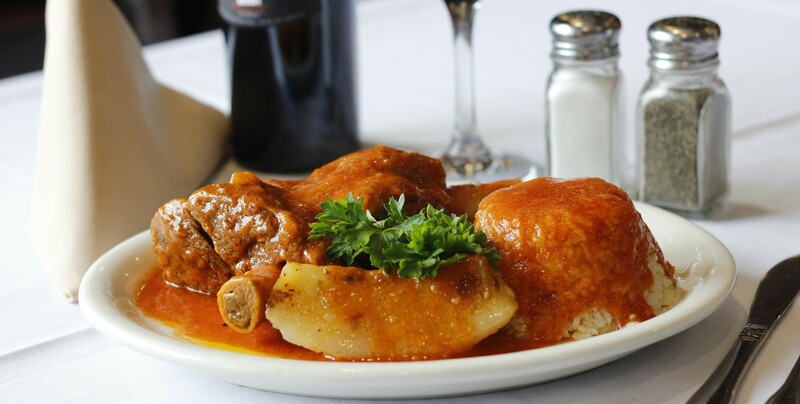 Colorado lamb shanks, slowly braised in our special tomato sauce. 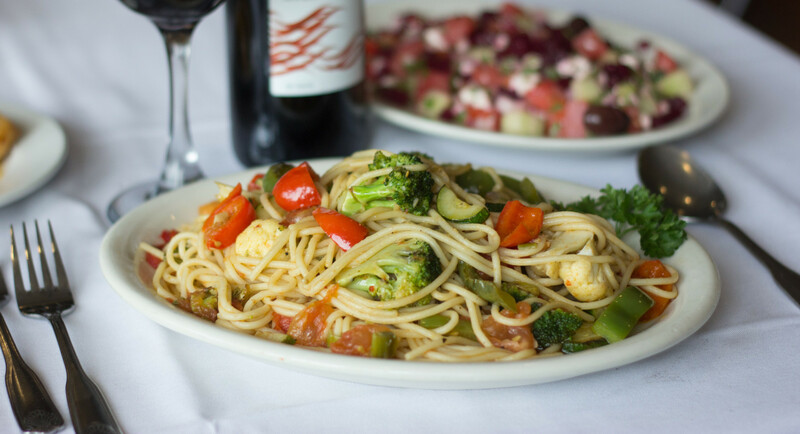 Served with rice, potatoes, mixed vegetables, spaghetti or thick Greek noodles. 8- (2 oz.) Homemade beef & lamb meatballs. Your choice of grilled or in our special tomato sauce. Thick cut, seasoned & broiled, served with our ladolemono. Fresh whitefish from Lake Superior, seasoned & broiled, served with our ladolemono. Baked shrimp, with tomato sauce & crumbled feta. Fresh shrimp, broiled in olive oil & garlic marinade. Tender octopus, char-grilled & tossed in our vinaigrette. Fresh squid, breaded & pan fried. Served with cocktail sauce. Choice of thick Greek noodles or spaghetti with burnt butter & grated Greek cheese. Fresh vegetables sautéed with garlic & served with spaghetti. Our homemade meat sauce, made with ground lamb & beef, served over thick Greek noodles or spaghetti. Chicken breast, sliced and sautéed with vegetables, garlic, fresh tomato & spaghetti. Fresh shrimp sautéed with vegetables, garlic, fresh tomato & spaghetti. Fresh calamari sautéed with vegetables, garlic, fresh tomato & spaghetti. Baked eggplant, zucchini, potato, artichoke & cheese topped with béchamel sauce. 2 Skewers of grilled vegetables with a vinaigrette dressing. 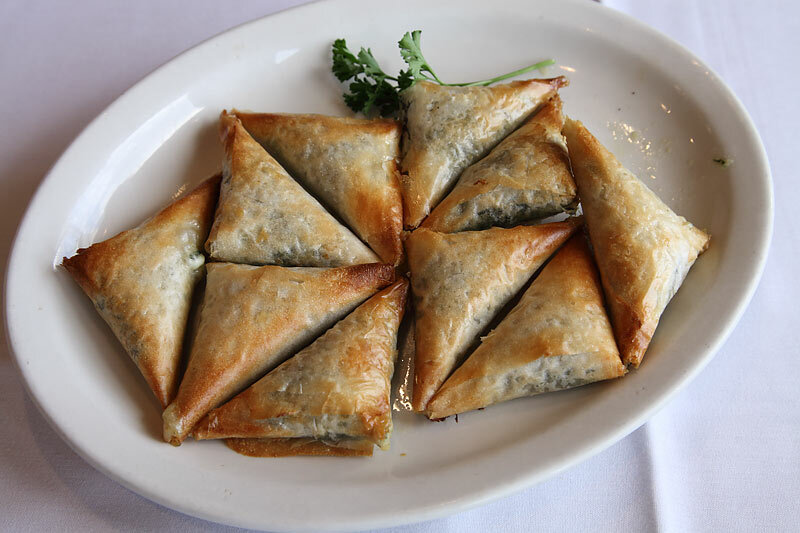 10 of our homemade blend of cheeses triangles, hand wrapped in filo dough. 5 spanakopitakia triangles & 5 tiropitakia triangles. All broiler dishes served with choice of soup & choice of rice, potatoes or mixed vegetables. 2 – 8 oz. Skewers of marinated chicken & vegetables. 12 oz. Boneless, skinless, chicken breast with ladolemono. Lamb riblets, seasoned & broiled to perfection. 6 Thin cut lamb chops (1 lb.) seasoned & grilled. 5 Loin lamb chops (1 lb.) seasoned & grilled. 2 Paidakia, 2 Loin lamb chops & riblets, seasoned & grilled. 2 – 6 oz. Skewers of filet mignon & vegetables marinated & grilled. 13 oz. Juicy New York strip steak, seasoned & broiled to perfection. 2 – 8 oz. Skewers of marinated pork & vegetables. 2 – 11 oz. Center cut pork chops, seasoned & grilled to perfection. 16 oz. Broiled special homemade Greek sausage. All Desserts are Homemade & Prepared Daily from Scratch with only the Finest Ingredients. Layers of Filo, Walnuts & Honey with Sprinkled Cinnamon. Sweet Walnut Cake with Cinnamon. Our Homemade Custard Pie, Wrapped in Filo & Topped with Syrup & Cinnamon. Shredded Kataifi Base with a Layer of Vanilla Custard & a Whipped Cream Topping with Slivered Almonds & Cinnamon. Coffee Dipped Ladyfingers, Layered Between our Special Egg, Cheese & Custard Mix, Topped with Cocoa. Layers of Chocolate cake, Chocolate custard & Cherries, topped with Chocolate Sprinkles. 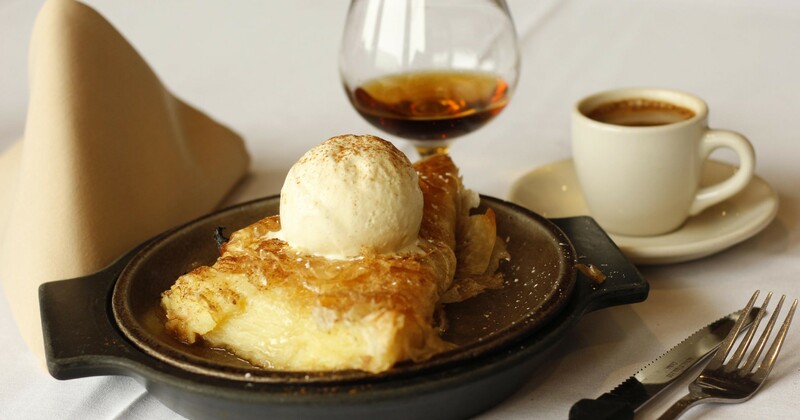 Milk Custard Wrapped in Filo Pastry, Topped with Ice Cream and Flambeed with Brandy. Our Homemade Yogurt. Have it by itself or Enjoy it with Honey, Nuts & Fruits. Baked Custard Flavored with Caramel. Rice Pudding with Sprinkled Cinnamon. We are Proud to Serve you Homer's Ice Cream. Flavors: Vanilla Bean - Chocolate - Strawberry - Mocha - Lemon Sorbet. Rice pilaf with homemade tomato sauce. Oven baked potatoes, seasoned with olive oil, lemon & oregano. Fresh cut fries with sprinkled oregano. Oven baked mixed vegetables with olive oil & fresh spices. Sweet peas baked in olive oil, tomato, onion & fresh dill. Okra baked in olive oil, tomato & fresh spices. Greek square noodles with fresh tomato. Greek orzo with fresh tomato. Steamed broccoli & cauliflower with ladolemono. 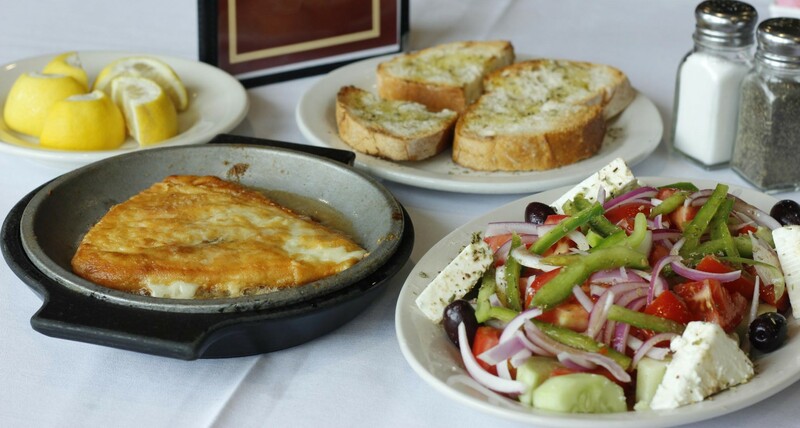 (FLOWN IN FROM GREECE) Broiled With Ladolemono (Olive Oil & Lemon) Served With Choice of Rice, Potatoes or Mixed Vegetables. 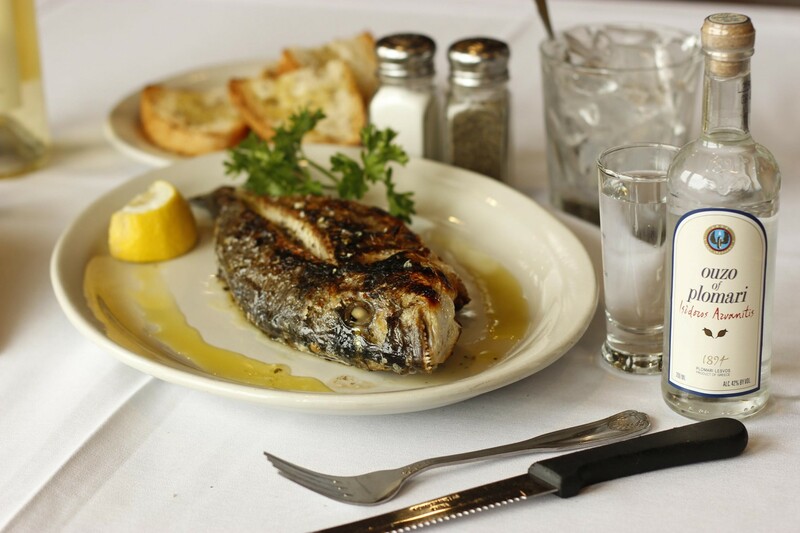 (STRIPED BASS FLOWN IN FROM GREECE) Broiled With Ladolemono (Olive Oil & Lemon) Served With Choice of Rice, Potatoes or Mixed Vegetables. Chicken Breast Stuffed with Spinach & Feta, Topped with Swiss Cheese. Served With Choice of Rice, Potatoes or Mixed Vegetables. 1/2 Chicken Baked in Olive Oil & Spices Served with Orzo. Braised Lamb with Special Tomato Sauce & Vegetable of the Day (briami, araka, bamies, fasolakia or spanakorizo). Oven Baked, Greek Style Baby Back Ribs, Marinated in Olive Oil, Lemon, Garlic and Oregano. Served With Choice of Rice, Potatoes or Mixed Vegetables. Baked Cod Fish In Tomato & Vegetable Sauce. Served With Choice of Rice, Potatoes or Mixed Vegetables. Pan fried whiting served with choice of side. Spring Lamb Baked In The Oven Served With Choice of Rice, Potatoes or Mixed Vegetables. Greek Style Beef Stew With Boiler Onions. Boneless Colorado Lamb, Braised in a special Tomato Sauce with Pasta of the day. Roast Baby Pig with Greek Spices served with choice of side. Tender Pork, Braised in an Egg-Lemon Sauce with Celery. Tender Pork, Braised in a light Tomato Sauce with Celery. Baby Goat, Braised in a special Tomato Sauce, served with Greek Noodles. Colorado Lamb, Braised in an Egg Lemon Sauce with Garden Vegetables. Braised Lamb with Fresh Artichokes In An Egg Lemon Sauce. Lamb with Endives Braised in an Egg Lemon Sauce. Prime Boneless Beef Braised in a Special Tomato Sauce served over Thick Greek Noodles. Prime Beef Short Ribs Braised in a Special Tomato Sauce served over Thick Greek Noodles. Tender pieces of Octopus, braised in a Special Tomato Sauce with Boiler Onions. Tender pieces of Octopus, braised in a Special Tomato Sauce with Elbow Macaroni. Whole Peppers and Tomatoes, Stuffed with Ground Meat and Rice. Served With Choice of Rice, Potatoes or Mixed Vegetables. Broiled with Ladolemono (olive oil & lemon) served with Choice of Rice, Potatoes or Mixed Vegetables. Ground Meat and Rice Balls with Vegetables in an Egg Lemon Sauce. Grilled 1/2 lb. ground lamb patty, w/ lettuce, tomato, & onion on a home-style bun. Served w/ rice & Greek potatoes or fries. 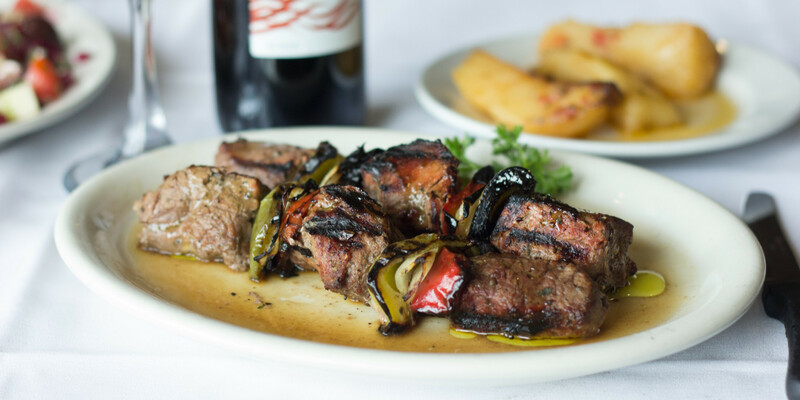 Ground lamb & beef skewer grilled to perfection. Served w/ rice & Greek potatoes or fries. 5 (2oz.) homemade lamb & beef meatballs in fresh tomato sauce. Served over spaghetti. 7 oz. Tilapia Filet, Broiled & Topped with Ladolemono. Served with Rice and Greek Potato. 1 Pork Skewer (7 oz.) Broiled to Perfection. Served with Rice and Greek Potato. 1 Chicken Skewer (7 oz.) Broiled to Perfection. Served with Rice and Greek Potato. 1 Greek Sausage (8 oz.) Broiled to Perfection. Served with Rice and Greek Potato. Served in a Pita, with Lettuce, Tomato, Onion and Tzatziki Sauce on the side. Thin Sliced Roast Leg of Lamb with Lettuce, Tomato, and Cheese. Served ON French Bread. Our Homemade Gyro Served on a Pita with Tomato, Onion, and Tzatziki Sauce. Greek Sausage Served on French Bread with Grilled Onions and Peppers. Cold Lima Beans, Roasted Red Peppers & Beets.